Ethan Mouser (13) of North Union jukes around a Fairfield Christian defender as Chaz Reeder (52) prepares to provide a block during the rushing effort. Mouser tallied 25 yards and one touchdown on two rushing attempts. Ask any high school football coach and he will tell you that four touchdowns on four plays is a pretty good effort. The North Union Wildcats exhibited a highly-efficient offense on Friday night in pummeling Fairfield Christian Academy, 72-7. The win was a true team effort as North Union’s youth got to play a large portion of the game. The Wildcat veterans started the ball rolling when Trevor Moran took North Union’s opening play to the promise land on a 73-yard run. Anthony Padovano pushed the point after kick to the right to keep the game at 6-0. After a three-and-out stand by the Wildcat defense, NU’s offense went back to work. This time, it was a one-play, 47-yard rush by Carson Smith. Padovano put the ball through the uprights to bring the score to 13-0. 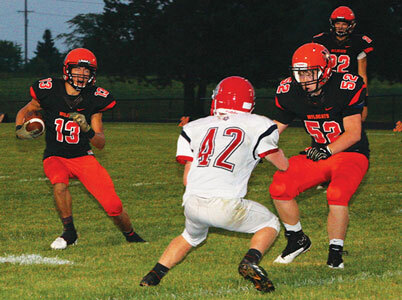 North Union’s defense picked up the intensity and allowed the Knights to run two plays before Dylan Thompson scooped up a fumble to give the Cats control of the ball at the Knights’ four-yard line. Trevyn Feasel got the nod to take the ball to the end zone on a run around the end. Padovano kicked another solid ball through the uprights to give the Cats a 20-0 lead with nine minutes left in the first quarter. The cycle continued for a fourth time when the NU defense shut down the Knights in four plays. North Union needed only one play to score another TD. This time, it was a pass from Padovano to Jaxson Harrah. Harrah trucked his way down the sideline for a 67-yard TD. Padovano’s PAT gave the Cats a 26-0 lead. The Knights had some success when they kept the ball to the ground, but the drive quickly stalled. FCA pinned the Cats deep with a punt that landed in the end zone for a touchback. The running duo of Moran and Smith, though, worked the ball down the field. The 80-yard drive concluded with Smith’s 20-yard run. The missed PAT left NU up 32-0. The offensive dominance continued as the Wildcat veterans put another TD on the board with Moran’s 13-yard run by Moran. NU held a 39-0 advantage after a successful kick by Padovano. “The older guys did what they needed to do early,” said Hajjar. That allowed NU’s younger athletes to receive some playing time under the lights . The youngsters didn’t disappoint, either. An interception gave the NU the ball with a short field. Ethan Mouser made short work of the situation with a 14-yard run for a TD. Grayson Beeney came on the field for the kicking duties and split the uprights to keep the scoreboard skyrocketing upwards with a 46-0 lead. The offensive power continued for North Union at Ethan Young found space for six points, followed by Caleb Isler and Young again to give the Wildcats a whopping halftime lead of 65-0. Young added another six points after the break. Beeney put another ball through the sticks to give North Union a 75-0 lead. Hajjar said he was very impressed with his younger players’ ability to hang in the action with the more experienced players of Fairfield Christian. “I thought they (the younger players) played well,” he said. “Some of those kids they were playing against were Friday night kids. The only blemish on the Cats’ game came late when the young defense gave up a six-yard passing touchdown for the Knights’ only points. The win gives NU a perfect 3-0 record in non-conference play. The Wildcats will move into Mid Ohio Athletic Conference action on Friday at Clear Fork. Hajjar said next week is going to be a different story as the Cats prepare for the Colts. “I think coming out of non-league 3-0 is something that we wanted to do,” he said. “We needed to do that going into conference play.